Hello. It’s been a true pleasure making your acquaintance during the last few days outside the Orot (Hebrew: Lights) Girls’ School in my hometown of Bet Shemesh, a sleepy backwater which was frankly really nice until you got here. The experience of protesting alongside you has been super, though, since, really – where else would we have met? Unfortunately, I don’t really have that many friends from other religions, so it has been nice to expand my horizons. It is amazing that in your religion, all of the Torah that matters really *can* be learned on one foot, as long as that foot is covered by a stocking. The elegance of being able to collapse your entire world into a single concept – Spread Thy Ignorance, Erase Thine Women from Everywhere but the Delivery Room, and Call it Superior – is just a little awe-inspiring in its total simplicity and apparent appeal to testosterone-based life-forms in tights (and turbans…..) Together with the all-black ensemble and the ability to travel light at a moment’s notice to whatever cause-du-jour you are called to, I daresay, you guys are pretty fabulous. We care about peace and quiet, are known to obsess about quality of life, are very busy with *jobs* (definitions can be found in the Talmud) and community work and army reserve duty and our own continuing (dual-curricular) education, BUT, like most parents, we are never too busy to protect and nurture our kids, in body and in spirit. Kids, male and female. Listen to this again: We care deeply about the education, personal development, happiness, safety, success, and future of our boys, and of our girls. We expect our girls to become productive, active, educated, helpful members of the broader community, and we invest in them heavily. Even those of us, like me, without daughters of our own. These girls will be raising my grandchildren one day, and that means they’d better be really smart and headstrong; I also hope they know how to find small objects that get wedged into the couch, which chromosomally challenged people (xy) swear have dissipated into space. But I digress. You said in several news outlets that you would carry on this fight for 20 years. In twenty years, notwithstanding your backward efforts, the first graders that you’ve been harassing will have more education, world experience, some even military experience, and certainly more vitality and promise, than any of the lot of you highly superior grown men, scions of the true something?….I dunno, I lost you at hello. Because we believe in our girls and the women they will become, the mothers and Torah scholars and doctors and teachers and lawyers (…here’s her card for when you get indicted re: above threat…) we will stand up for their right to a great future. We sincerely hope that more of your moderate Haredi neighbors, with whom we differ on many things but can successfully share a national space, will begin to see that they will need to choose a side here, as painful a step as that may be. In any event, my Zealot Shmoopie, I’m not sure you understood all this about us before you started this little dance of ours. But it’s been real. See you around. But hopefully (Seinfeld fans? Care to join me?) not around me. Gadol! Nail on the head. My first time reading any of your posts. BRILLIANT, biting and damn funny. It was forwarded to me in an email. I hope this goes viral. You have a good voice, and you’re fighting the good fight. You’re fantastic Suha (your Burka Babe pseudonym for those who don’t know )!! I have actually had the pleasure of meeting quite a few Haradi women (whom I would otherwise never have met since we don’t shop at the same stores or send our kids to the same schools)at Rikudei Am! It’s a great equalizer (yes – there are even non-religious women in the class!) and it’s frankly too bad that their hubbys don’t dance…even at their own Rikudei Am sessions. I bet they’d be MUCH happier people! Totally accurate and brilliantly written. And I appreciate your (implicitly) raising a question that I’ve long pondered: which religion exactly do these guys belong to? I’m no expert in comparative religion, but nothing in their behavior in this town from day one remotely resembles the Judaism I know and love (or any normative variations thereof). As for Nettie Feldman’s comment about the alleged “non-future” of Beit Shemesh. God forbid. We had, and have, a beautiful and (extremists aside) mutually tolerant city and communities; we have built quality schools and shuls; and Beit Shemesh is in a wonderful location, between Jerusalem and Tel Aviv. “They”, OTOH, are at most a gang of a few hundred families with some designated thugs among them, in a city of 80-100 thousand residents. Let them leave! I AM NOT GOING ANYWHERE. Furthermore, if there’s anything these past two weeks have shown, it’s that if we shout them down, surround them in the streets, bring in the press and the cops, etc. — they will lose, because the justice is with us. And this battle occurred in the worst possible circumstances: i.e., with a Mayor and his men (only men) who were clearly against us. Hopefully, that will change sooner or later as the coalition falls apart and/or as different groups of Charedim get angry at the Mayor for different reasons and split the Charedi vote, etc. In any event, if we give up, then violence and intimidation wins. Even violence and intimidation by a relatively small group of thugs who, as Sara correctly pointed out, have no experience, education or pretty much anything else going for them. We and our children – boys and girls – do, B”H, and there’s no reason that we can’t win both the battle and the war. Our homes and our communities are at stake. We can do nothing less. Brilliant. I have to admit, though, this is one of the reasons I’m glad I don’t live in Bet Shemesh. What a pleasure to find this site. I have a few years’ worth of posts to check out! The social dynamics within the Haredi communities are considerably more complicated than this post would have you believe. Haredi women, being both better educated and the bread-winners are slowly gaining power. The Haredi male leadership recognizes this and is fighting back by placing further restrictions on them. To better understand what the Haredim are trying to accomplish, I suggest reading The Earth is the Lords by Dr. A. J. Heschel, who can hardly characterized as a Haredi sympathizer. No doubt, Ben – and, now that you raise it, a clarification: This post was directed at the extreme element in Haredi society, and those in the community who allow it to flourish b/c it is convenient, or because the outside world is even scarier than Neturei Karta, or, like our Mayor, who cynically exploit this type of retro-activism for his own purposes. I think the future of that community lies in its ability to battle extremism of all types, especially when it takes the form of misogyny, b/c extremism of any nature has never been good for the Jews, and women as a central presence in society are now here to stay. Although I long ago left Bais Ya’akov and most of the things they tried desperately to teach me, I certainly empathize deeply with the struggle to maintain deeply traditional values in a crazy world… but that does not mean we can excuse anti-Torah behavior operating in the name of Torah. Extremism and more particularly the rejection of any worldview not exactly the same as your own is part and parcel of our tradition. As are inclusiveness, pursuit of peace, and improving the world. Our tradition is broad; the trick is to evolve and spread light in so doing. Well said. Evolving as a people is a painful process. I know I’m a little late on the bandwagon, but just wanted to say that this post is excellent. 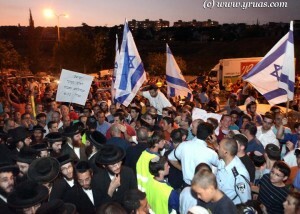 I hope it all gets sorted out in Bet Shemesh. by respecting and showing consideration for your fellow jew. Most Chareidim are not like this and the entire Jewish people needs to work on Ahavat Chinam and RESPECTING the derech of each and every Jew rather than belittling another sect just because you disagree with their ideas. V’Ahavta L’reacha Kamocha.. Stop the hate and increase the LOVE. We want Moshiach NOW!